If you have a long weekend coming up (and I hope you do), perhaps you’re looking forward to it for the same reason I am—three opportunities, three days in a row, to enjoy an unhurried breakfast. What luxury! Truth be told, these scrambled eggs only take five minutes longer to prepare than the standard sort, an investment that might even be thinkable on a weekday. But those five minutes yield excellent returns: they give you a little crunch, a little creaminess, and a lot of herbaceous wake-up in your bowl. And yes, it’s really just scrambled eggs and toast, but if you have never crouton-d your toast into your scrambled eggs you are in for a nice surprise. 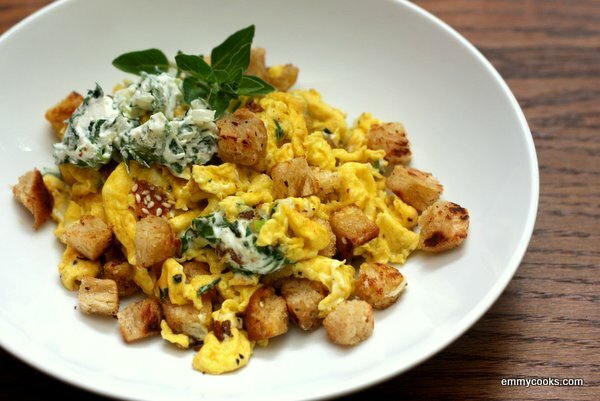 Scrambled Eggs with Croutons and Herbed Cream Cheese: You can take the herbed cream cheese mixture in any direction you like, but this time mine was packed with scallions, parsley, and a lush sprig of oregano. Chives, basil, dill, marjoram, a pinch of thyme–as long as you start with equal-sized piles of chopped soft herbs and cream cheese, you can hardly go wrong. You’ll want a pinch of salt too, of course. Once you’ve mashed up your herbed cream cheese, take the adventurous step of chopping your bread into bits instead of toasting it whole. (Challah is nice here, of course.) Toast the croutons in olive oil over medium heat with a pinch of salt until golden and crispy, then dump them out, lower the heat, and scramble your eggs in the same pan. When the eggs are nearly set, stir in half of the croutons and half the herbed cream cheese. Remove from the heat when the eggs are cooked to your liking, and serve garnished with another dollop of cream cheese and the remaining croutons. This entry was posted in Breakfast, Eggs, Emmy Cooks Original, Food, Recipes and tagged bread, breakfast recipes, challah, cream cheese, croutons, eggs, green onions, herbs, oregano, parsley, scrambled eggs, vegetarian on May 23, 2013 by emmycooks. This reminds me so much of a breakfast that I enjoyed at a B and B last year. I know it has to taste terrific. This sounds like the best possible way to mix up the texture of scrambled eggs! And the cream cheese sounds so flavorful and rich. Yay! What a lovely idea. I’ve made fried eggs in bread crumbs before, which was delicious. I’m sure this is too! Good IDEA! Crisp the breadcrumbs first, or do they crisp as the egg cooks? I’ll be experimenting…. Oh my goodness… croutons and scrambled eggs? Does it get any better than this?! I have a three-day weekend as well and might have to give these a try! This is an interesting idea. I’d never think of this combo myself! Loved this recipe! The herbed cream cheese and croutons made for a special weekend breakfast, it was fast, and my 3 year old thought it was fun. We’re going to serve it with smoked salmon next time. So good, thanks! Looks fantastic! Reminds me a little of migas but with croutons instead of tortilla chips! Just like my grandma makes! Yum this looks like a very tasty breakfast!! looks delicious! I love making up a big tasty breakfast on the weekends!